Published in Sweden VS Assange – Human Rights Issues. Libertarian Books, Sweden, 2014. Pages 106-108. Amidst these battered times for Sweden’s judicial reputation, few things would have been more revitalizing than a statement by the Attorney-General, setting the record straight on the international criticism concerning the mismanagement of the Julian Assange case. However, your comment on the public stance of the Liberal Party’s judicial spokesperson Johan Pehrson MP, gravely risks the prestige of the Swedish legal system. There have been many instances of political interference in this case by the Swedish government. For instance, the statements by Prime Minister Fredrik Reinfeldt and the Foreign Minister Carl Bildt. Is it that you consider that the Montesquieu principle, 2 that you have used as your main argument, contains an exception regarding the governmental interference in an ongoing case? Considering your comments to Johan Pehrson MP, it is peculiar that the General Prosecutor Office did not issue a statement defending the “independence of the judiciary” from executive power? This type of selective behaviour creates a perception that the Swedish judiciary is not independent. The principle of the separation of powers precludes the interference by the Legislative of the Judiciary, and vice versa. Is it appropriate, as Sweden’s Attorney-General, to publicly criticise Johan Pehrson MP for exactly the same behaviour that you exhibited? Why would a representative of the Judiciary try to inhibit an initiative by a member of the Legislature, which seeks to find a solution to this deadlocked case, that has become a serious political burden both domestically and internationally? It is known that both the Ecuadorean government and Julian Assange would welcome the questioning of Julian Assange in London, which is standard Swedish praxis. Julian Assange has never refused to be questioned. However, he has stated that he feels there is a risk of being further extradited to the U.S.
Julian Assange’s concern is based on the fact that, in circumstances where someone has been sought for extradition by the U.S. government, and they were on Swedish soil, Sweden has granted every request. A. The Swedish prosecutor has refused to question Julian Assange in London and instead, for no apparent reason, requires him to come to Sweden, where he will be immediately held incommunicado. A state that would prevent normal contact with his lawyer. B. Julian Assange, in an assessment that has been shared by the Ecuadorean government, has legitimate concerns regarding an onwards extradition from Sweden to the U.S. You must be aware that, according to well known Swedish praxis, 5 this step – if it takes the form of an extraordinary rendition – does not need to be cleared by the Judiciary. C. This situation could be immediately solved if the Swedish government extends a guarantee that Julian Assange will not be deported. If this were to happen, Julian Assange would be willing to be questioned in Sweden. D. However, the government, for no tenable reason, refuses to extend these guarantees and ultimately these extradition decisions are the privilege of the government, not the Judiciary. Against this backdrop, why would you consider it “strange” that Johan Pehrson MP, a member of the Justice Committee of the Swedish Parliament, is trying to find a solution to the current stalemate? Many outside Sweden are concerned by the Swedish prosecutor’s refusal to question Julian Assange in London and the government’s refusal to issue a non-deportation guarantees, both of which are delaying the resolution of this case. I believe this is either caused by political factors, or because the prosecutor does not have a legitimate case against Julian Assange. Either way, it is your responsibility to end this remarkable situation as soon as possible. 1. “Prosecutor slams politician’s comments on Assange case”. Swedish Radio, 3 Feb 2014. 2. Montesquieu. De L’Esprit Des Loix. Chatelain, 1749. 3. “– Det är beklagligt. Vi har ett självständigt rättsväsende som i det här fallet dessutom agerat på svensk lagstiftning. Man har till allmänt åtal instämt Julian Assange för anklagelser om våldtäkt, sade Reinfeldt då till journalister i riksdagen.” “Jag kan bara beklaga att kvinnors rätt och ställning väger så lätt när det gäller den här typen av frågor jämfört med andra typer av teorier som förs fram.” In: “Reinfeldt beklagade negative bild av rättsväsendet”. DN, 11 Feb 2011. 4. “Assange är en väldigt feg person som inte vågar konfrontera anklagelserna mot honom.” “– Om han har gjort det han är anklagad för så tycker jag att man kan kalla honom för ett kräk. 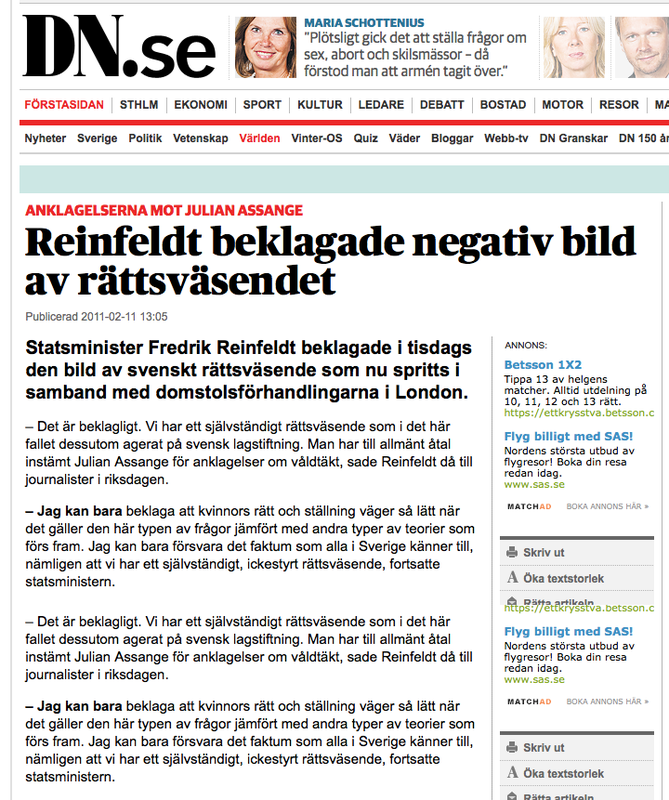 Han verkar vara en ynklig stackare.” In: “Hägglund om asyl för Assange: “Fegis” . Expressen, 4 Febr 2012. 5. Resolution on Sweden by the UN Committee Against Torture, CAT/C/34/D/233/2003, 24 May 2005. Very well expressed and relevant that really puts the finger on why everybody should aim for solutions instead of being age-defying children in a sandbox who have built their perception of reality around a mix of fairy tales and fixations (they believe they are the good ones, but lack insight of the negative effects of their provinsial, hence rudementary understanding of the world) . Someone grown up and wise need get some sense back into this circus. Svd and dn should take it on its debate pages, especially after elisabeth massi fritzl somewhat confused and deluded contribution that tell more about her disparate understanding of the reality which cause grave negative effect for the client she represents. Instead of actually use the chance to help her client to push this forward. She rather see this will always haunt her client for years to come and never let the poor woman heal the wounds this whole process has caused her. This is no time for EMF to teach the world how good Sweden is and they should therefore obey her commands, instead she should dare to face the reality as it is, and find best solutions accordingly.